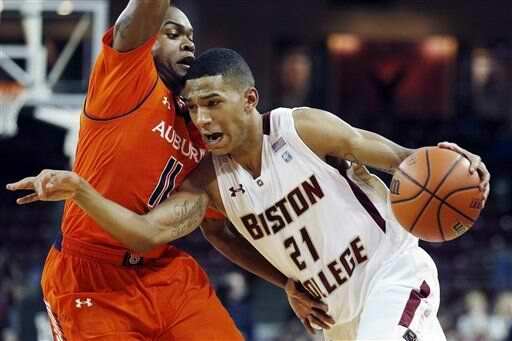 BOSTON COLLEGE 50, Auburn 49 - Freshmen Olivier Hanlan and Joe Rahon combined for 34 points to lead Boston College to a 50-49 win against Auburn on Wednesday evening at Conte Forum. Hanlan led the Eagles with 19 points, and added six rebounds and two steals. Rahon recorded 15 points. Sophomore Ryan Anderson led BC on the glass with seven rebounds while sophomores Patrick Heckmann and Lonnie Jackson both had three assists. The first half was tight the entire 20 minutes as there was no lead larger than four points. Auburn took an early 6-3 lead three minutes into the game but Hanlan ended that quickly with a 3-pointer to knot it up for the first time. After a couple of lead changes, the Tigers led 19-17 with 7:29 on the clock. Hanlan hit a jumper and Rahon sank a three to give BC a 22-19 lead at the 5:50 mark. Recap. FLORIDA STATE 75, North Florida 67 - Michael Snaer scored 17 of his 21 points in the second period as the Seminoles (4-1) won their fourth consecutive game. The 'Noles will now prepare to face Minnesota at home Monday as part of the ACC/Big Ten Challenge. FSU led 16-3 in the game's early moments but saw that lead slip to a 32-24 score at halftime. Then midway through the second half, FSU had its biggest lead of the night - a 14-point advantage - but UNF's timely triples from long range kept the game within two possessions throughout much of the contest. Recap. #9 NORTH CAROLINA 112, Chaminade 70 - James Michael McAdoo scored 18 points to lead five North Carolina players in double figures and the ninth-ranked Tar Heels routed Division II Chaminade 112-70 on Wednesday night in the Maui Invitational. It was the first time this season that the Tar Heels (5-1) have topped the century mark. They put up 62 points in the first half after being held to 18 points in the first half in Tuesday's loss to Butler. Recap. VIRGINIA 80, North Texas 64 - Freshman Justin Anderson scored 14 points, and freshmen Teven Jones and Evan Nolte added 13 each as Virginia defeated North Texas 80-64 in NIT consolation action on Tuesday night. 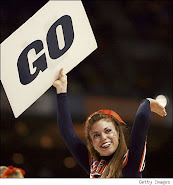 Virginia had five players score in double figures. Tony Mitchell led North Texas (3-3) with 16 points. Virginia (4-2) shot 59 percent from the field (27 of 46), including 73 percent from 3-point range (8 of 11), and held North Texas to 36 percent (21 of 58). After trailing by 20 at the half, North Texas, using a full-court press, whittled the lead to nine on a 3-point play by Jordan Williams, but Virginia responded with a 10-2 run to pull away. Recap. MARYLAND 83, Lafayette 74 - Alex Len scored 16, James Padgett had 14, and Maryland never trailed in an 83-74 win over Lafayette on Tuesday night. Nick Faust had 13 points and eight rebounds, freshman Charles Mitchell scored 12 and Dez Wells added 11 for the Terrapins (3-1), who have won three in a row following a season-opening loss to defending national champion Kentucky. In this one, Maryland's inside game was enough to overcome the Leopards' deft outside shooting. The Terrapins finished with a 44-28 rebounding advantage and scored 50 points in the paint, but Lafayette stayed relatively close by going 15 for 32 from 3-point range. Seth Hinrichs led the Leopards (1-4) with 20 points and Joey Ptasinski had 14. Sophomore Dan Trist missed a third straight game with a sprained left ankle after scoring a career-high 30 in Lafayette's overtime win over LIU-Brooklyn. Recap. Butler 82, #9 NORTH CAROLINA 71 - Rotnei Clarke and Kellen Dunham each scored 17 points Tuesday night to lead the unranked Bulldogs past No. 9 UNC, jumping out to a 17-point halftime lead and holding back several second-half surges from the Tar Heels in the second round of the Maui Invitational. The Tar Heels (4-1) missed their first three shots and scored 18 points in the first half.